These tiny totes are zip up pouches that unfold to a tote bag with a front pocket. Its a great way for your child to carry an extra tote bag to school for a class project, or extra papers that they need to bring home. When not in use the bag can be folded back inside the zippered pouch, and takes up very little room. 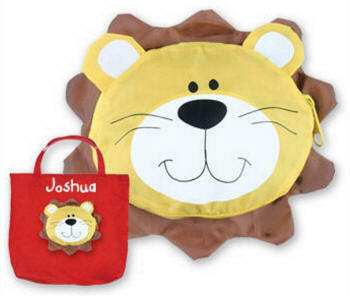 Available in four designs, the flower, butterfly monkey and lion match our other Stephen Joseph accessories, such as backpacks and lunch boxes. These tote bags can be personalized on the top of the tote back. Made from 100% polyester, they can be spot cleaned. The top of bag has a small Velcro closure and measures 14 in x 15 in when opened (excluding straps). The pouch is approximately 5 1/2 in. high and 4 1.2 in. wide.